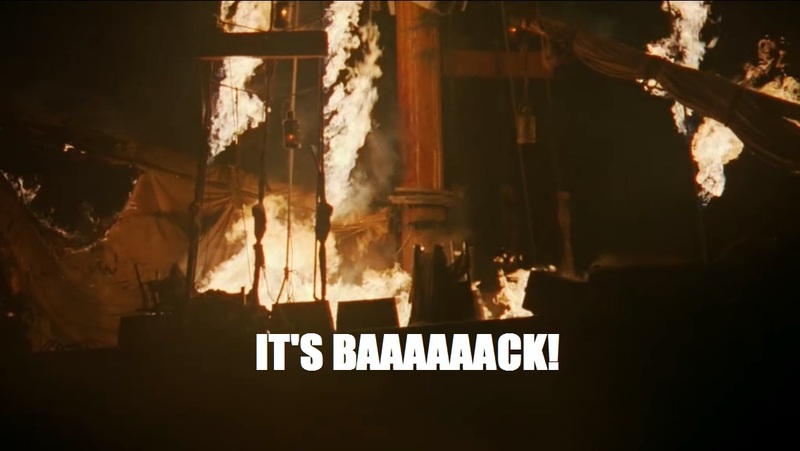 After ten months of agony, Outlander returned for its second season, and all I can say is holy smokes. Every ounce of the episode was so chock-full of amazingness that it’s hard for me to put my thoughts into words. Well, words that aren’t “JAMIE FRASER, I LOVE YOUUUUUUUUUUUUUU!” Claire’s sass was back in full effect, the cinematography and score made me lose my freaking mind, and my living room became more and more overheated every time Jamie said “Broch Tuarach.” (I don’t know why it happens. It just does, okay?!) Outlander is without a doubt the finest show on television right now, and I think we can all agree that Caitriona Balfe, Sam Heughan, Tobias Menzies and everyone involved in the show should have their arms full of Emmys. I sincerely hope that it finally wins some much-deserved awards this year, but in the meantime, I’ve decided to honor some lesser-talked-about aspects of the show with some kudos of my own. 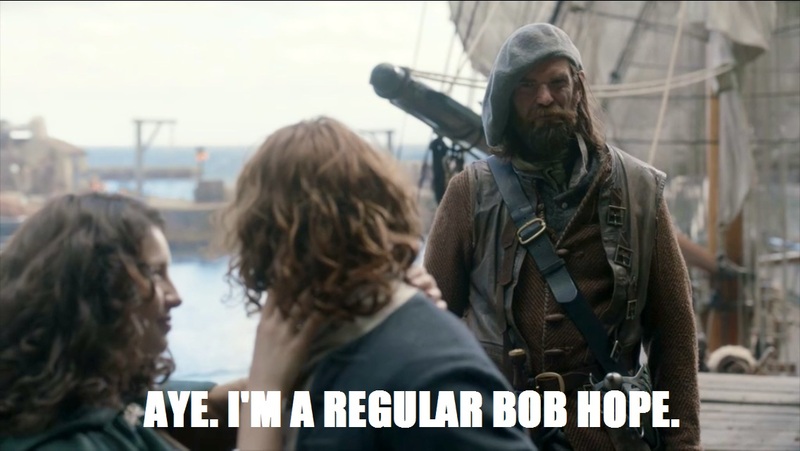 Welcome to Outlander Superlatives, where every week I’ll break down the real stars of each new episode. To kick us off, here’s my take on the shining stars of Episode 201, Through a Glass, Darkly. Note: If you haven’t watched the episode yet, what are you doing?! Get on that, now! Oh, and also, there are spoilers ahead. Frank. Frank! When did I ever care about Frank? 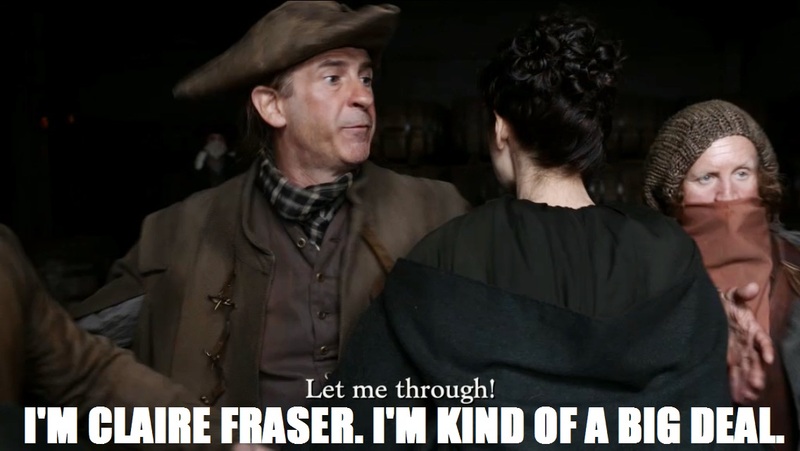 The answer is pretty much never, but Tobias Menzies is so freaking good in this episode that I almost didn’t care that it took us 38 whole minutes to get to Jamie. 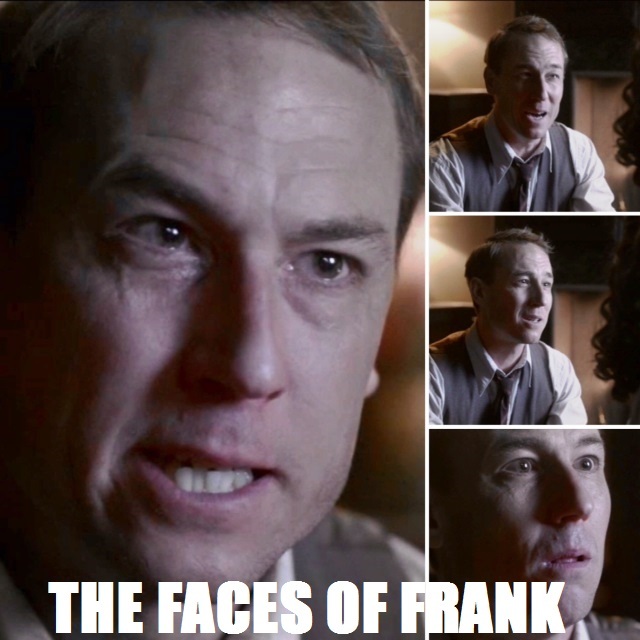 The range of emotions we saw Frank go through in the span of minutes was so compelling that I really wanted to give him a hug. Until he went and smashed up all of Reverend Wakefield’s stuff. (Not cool, Frank! Reverend Wakefield is the best. What did he ever do to you?) Honestly, though, I still can’t wrap my mind around the fact that this is the same actor who played Black Jack Randall. Someone please just give him all the awards ever already. Maybe I’ve just gotten used to seeing Claire in her 18th century garb, but man did she look extra lovely in that sweater vest. It made me desperately wonder: Should women’s sweater vests make a major comeback? 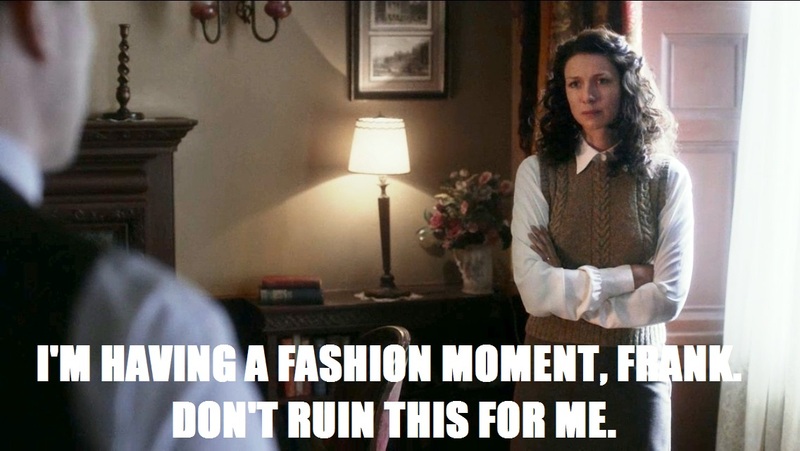 Could I pull off a sweater vest like Caitriona Balfe? Is this why I’ve held onto that sweater vest I bought ten years ago with the little hounds on it? 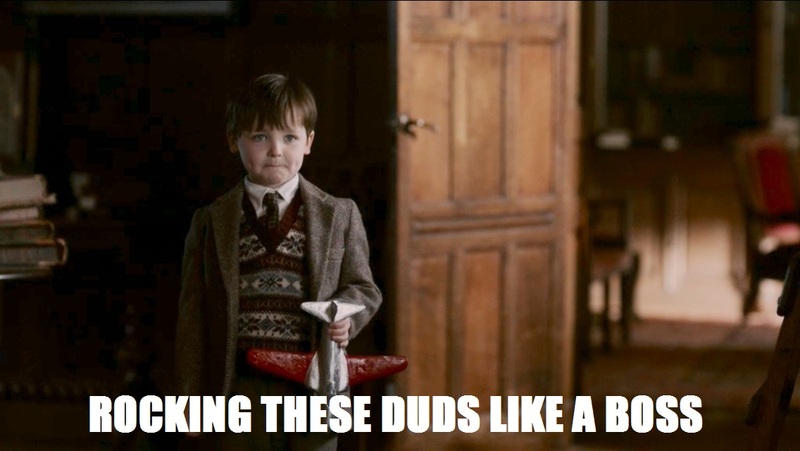 Would Claire wear a sweater vest with little hounds on it? And it wasn’t just Claire. Wee Roger was also rocking a sweater vest, and since he’s one of my favorite characters in the Outlander universe, he really took this fashion statement to a whole new level. In short? Sweater vests basically won this whole episode. If the Outlander hairstylists were aiming for that Baby Houseman look, they totally succeeded. And somehow, it absolutely worked. 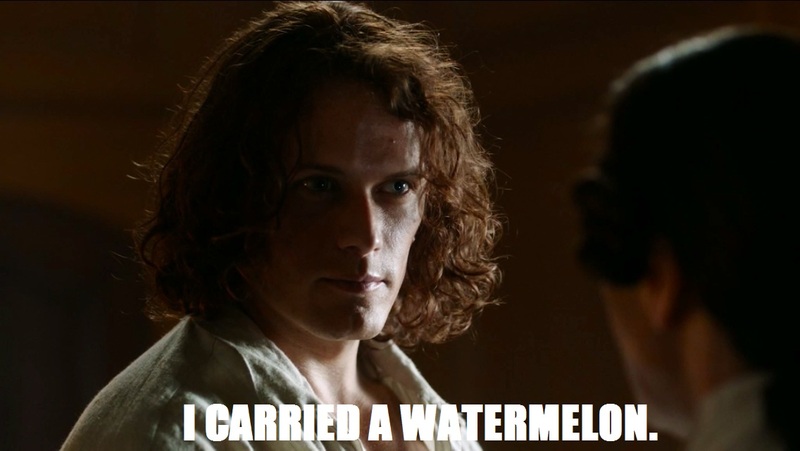 Jamie’s hair was luminous. Even while I was engrossed in the story and feeling all the feelings, I kept thinking about how soft it looked and how perfect those curls were and how I really just wanted to touch it just for a second. If he wants to infiltrate the Jacobite rebellion, all he has to do is give them his styling tips. They’ll be eating out of the palm of his crooked, beautiful hand. Murtaugh takes the cake this week with his one-liner: “France. Reeks of frogs.” Extra points because it came in the middle of Jamie and Claire’s lovey dovey talk. Extra extra points because we know Murtaugh doesn’t exactly smell like a daisy. Honestly, I could praise every aspect of this episode because it was pretty much the most perfect thing I’ve ever seen—or second most perfect thing, after Jamie’s cheekbones (#sorrynotsorry)—but I’ll turn it over to you. What did you think of the new episode? Are you beyond excited for next week?